This is not an account of the conquests of Nadir Shah. That has been written about umpteen numbers of times. This is a story of the mentality of the person who lived within Nadir Shah. 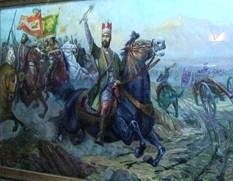 Nadir Shah aka Nader Shah aka Nadr Qoli Beg aka Ṭahmasp Qoli Khan (born Oct. 22, 1688, Kobhan, Ṣafavid, Iran—died June 1747, Fatḥabad). He was an Iranian ruler and conqueror who created an Iranian empire that stretched from the Indus River to the Caucasus Mountains. Nadir Shah – known for his military genius and is also called “The Second Alexander” and “The Napoleon of Persia”. He had elevated his country as the foremost military power in Asia. Unfortunately, his triumphs were at the expense of incalculable suffering and terrible loss of life. His grandiosity, his insatiable desire for more conquests and his egocentric behaviour suggest a narcissistic personality disorder and in his last years he seems to have developed some paranoid tendencies. Eventually, although brilliantly successful as a soldier and general, Nadir Shah had no great talent for statesmanship or administration, and Iran was utterly exhausted owing to his constant warfare, during the later years of his reign. Tens of thousands of people perished in his ceaseless military campaigns, and the exactions of his tax gatherers ruined the country’s economy. Nadir Shah had always been harsh and ruthless, but these traits became more pronounced as he grew older. His suspiciousness and capricious cruelty continued to grow, and wherever he went he had people tortured and executed. The consequence was that revolt after revolt against him occurred. In the end he was assassinated by his own troops while attempting to crush an uprising in Khorasan. Nadir Shah’s obsessive interests were war and conquest. With passage of time, Nadir Shah’s greed and intolerant nature became more pronounced. Nadir imposed the death penalty on those who failed to pay his taxes. He stored most of his loot for his own personal use without any concern for the general welfare of the country. His quest for power made him concentrate all power in his own hands. Although, a brilliant soldier and the founder of the Persian navy, he had no interest in art and literature either. Nadir Shah (1688-1747) was the son of a poor peasant, who lived in Khurasan and died while Nadir was still a child. Nadir and his mother were carried off as slaves by the Ozbegs, but Nadir managed to escape and became a soldier. Soon he succeeded in attracting the attention of a chieftain of the Afshar1i, in whose service Nadir rapidly advanced. Eventually, the ambitious Nadir fell out of favour. He became a rebel and gathered a substantial army. Nadir deposed the then ruler of Iran-Tamasp in 1732 and installed Tamasp’s infant son, Abbas III (1732-1740), on the throne, naming himself as regent. In 1736, Nadir evidently stabilized his own position firmly and ascended the throne himself. Nadir Shahs greedy and intolerant nature…. Nadir Shah’s personality was that of a conqueror, who invaded India in 1738-39 after ascending the Persian throne in 1736. He had smelt blood which had culminated in an increasing lust for blood in his as it gave him authority, power and supremacy, but he was greedy and intolerant in nature. History had recorded Nadir Shah’s Invasion of India has gone down in history as an unforgettable foreign invasion on Indian soil, wherein Emperor Nadir Shah, the Shah of Iran (1736–47) had marched in with a fifty-five thousand strong army, and eventually attacked Delhi in March 1739. He had sacked the city, after issuing orders for a general massacre to take place-which became notorious as the “Nadir Shahi Farmaan”. His army had defeated the already weakened Mughal emperor Muhammad Shah (Rangila) at the battle at Karnal and had taken over control of northern India. Nadir shah had stormed over the Hindu Kush Mountains into India, which, at that time, was under the rule of the Mughul Empire. The Mughal Empire was already weakened and reeling under the impact of bitter wars of succession of past three decades, after the death of Aurangzeb. The current ruler, Muhammad Shah, was incapable of arresting the disintegration of the empire. The imperial court administration was corrupt and rendered weak, But India, as the country was still extremely rich with the prosperity and prestige of Delhi still held at a high esteem. Nadir Shah was attracted by the India’s wealth and came seeking for it, plundering all in his wake. There was blood bath; towers were erected of decapitated heads of the defeated for just the refusal of the Mughal Emperor to hand him over the Afghans who had rebelled against him. Nadir seized upon this refusal as a pretext for war and defeated his Afghan enemies fleeing into the Hindu Kush. He moved ahead seizing Ghazni, Kabul and Peshawar and advanced onto the Punjab and captured Lahore. Nadir advanced to the river Indus before the end of year as the Mughals mustered their army against him. At the Battle of Karnal on 13 February 1739, Nadir led his army to victory over the Mughals. 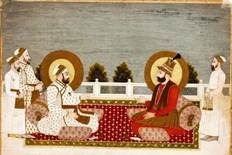 Muhammad Shah surrendered and both entered Delhi together. The keys to the capital of Delhi were submitted to Nadir Shah. He entered the city on 20 March 1730 and occupied Shah Jehan’s imperial suite in the Red Fort. Coins were struck, and prayers said, in his name in the Jama Masjid and other Delhi mosques. The next day, Nadir Shah held a great durbar in the capital. With his greed and intolerance he snatched all what he desired. As an arrangement Mohammad Shah’s daughter was betrothed to Nadir Shah’s grandson, According to custom Mohammad Shah’s name was uttered reciting his lineage to seven generations back (Babur, Humayun, Akbar, Jahangir, Shah Jahan, Aurangzeb, Bahadur Shah). Being a shepherd’s son, Nadir shah had no such claims of lineage. 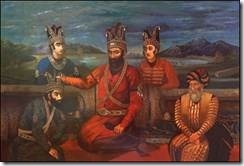 Incensed at the proud lineage of Mohammed Shah, the Persian conqueror-Nadir Shah told his priests to repeat ‘Nadir Shah, son of ‘Sword’, who is the son of the ‘Sword’ ‘ seven times! Delhi was reeling under the assault and the Persian occupation led to price rises in the city. The city administrator attempted to fix prices at a lower level and Persian troops were sent to the market at Paharganj, Delhi to enforce them. However, the local merchants refused to accept the lower prices and this resulted in violence during which some Persians were assaulted and killed. Then a rumour spread that Nadir had been assassinated by a female guard at the Red Fort. Some Indians attacked and killed Persian troops during the riots that broke out on the night of 21 March 1739. Nadir Shah was furious at the killings and retaliated by ordering his soldiers to carry out the notorious ‘qatl-e-aam’ (sack) of Delhi. On the morning of 22 March 1739, that day was ‘Holi’, Nadir Shah rode out in full armour and took a seat at the Sunehri Masjid of Roshan-ud-dowla near the Kotwali Chabutra in the middle of Chandni Chowk. He then, to the accompaniment of the rolling of drums and the blaring of trumpets, unsheathed his great battle sword in a grand flourish, amidst great and loud acclaim and cheers of the Persian troops present. This was the signal to start the onslaught and carnage! In compliance of Nadir Shah’s affirmative gesture, the fully armed Persian army turned their swords and guns on to the unarmed and defenceless civilians in the city. The Persian soldiers were given full licence to do as they pleased and promised a share of the booty as the city was plundered. Heavens reverberated with the blood curdling screams of those being killed, Chilling everyone who heard them. Areas of Delhi such as Chandni Chowk and Dariba Kalan, Fatehpuri, Faiz Bazar, Hauz Kazi, Johri Bazar and the Lahori, Ajmeri and Kabuli gates, all of which were densely populated were soon drenched in blood. The town was reduced to ashes. Muhammad Shah was forced to beg for mercy. These horrific events were recorded in contemporary chronicles such as the Tarikh-e-Hindi of Rustam Ali, the Bayan-e-Waqai of Abdul Karim and the Tazkira of Anand Ram Mukhlis. Finally, after many hours of desperate pleading by the Mughals for mercy, Nadir Shah relented and signalled a halt to the bloodshed by sheathing his battle sword once again. It has been estimated that during the course of six hours in one day, 22 March 1739, approximately 20,000 to 30,000 Indian men, women and children were slaughtered by the Persian troops during the massacre in the city. Sublime Greed of Nadir Shah…. The city was sacked for several days. An enormous fine of 20 million rupees was levied on the people of Delhi. Muhammad Shah handed over the keys to the royal treasury, and lost the Peacock Throne, to Nadir Shah. Amongst a treasure trove of other fabulous jewels, Nadir also gained the Koh-i-Noor and Darya-ye Noor diamonds. “Nadir Shah knew that Mohammad Shah, carried his ‘Koh-i-Noor’ in his turban. 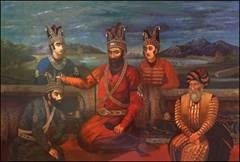 Persians including Nadir Shah too wore turbans. Nadir Shah invoked a Persian custom of exchanging turbans of the marrying couple’s elders (Mohammed Shahs daughter and Nadir Shah’s grandson), as a mark of honour. Mohammad Shah couldn’t say ‘no’ and Nadir Shah carried away the turban with the Koh-i-Noor! With Nadir Shahs greed and blood lust satiated, Persian troops left Delhi at the beginning of May 1739. Nadir’s soldiers also took with them thousands of elephants, horses and camels that were laden with the booty that they had seized. His subjects, Persians were spared taxes for three years after that. In the evening Nadir would retire to his private apartment, where he usually supped with three or four his favourites. He drank wine with moderation, but was very fond of women. In his later days, Nadir had 33 women in his harem. Nadir preferred to speak in Turki (Eastern Turkish), but he could converse in Persian, too. His contemporaries mentioned his remarkably loud voice, which enabled him to make his commands easily heard. From 1739 onwards, Nadir used to dye his beard and moustache black, thus keeping a youthful appearance. During the 1740s he lost several of his front teeth. In his later years, revolts began to break out against Nadir’s oppressive rule and his increasing lust for blood and money. He suffered from dropsy, and as a result he was troubled at times by severe melancholia and outbursts of rage. In 1743 Nadir was treated for a liver complaint. In the summer of 1745 he was seriously ill and had to be carried in a litter. He suffered from constipation and had frequent attacks of vomiting. Inherent suspicious tyrant, who could trust no one….. Following an assignation attempt, Nadir Shah began to exhibit signs of mental derangement. He suspected his own son, Reza Quli Mirza (1719-1747), of plotting against him and had him blinded. Thereafter, he started executing the nobles who had witnessed his son’s blinding. Gradually Nadir’s attacks of frenzy became periods of actual insanity which recurred with increasing frequency. In January 1747 he left Isfahan for Kirman. Wherever he halted, Nadir had many people tortured and put to death. He had towers of their heads erected. In March he crossed the terrible Dasht-i-Lut desert, where many of his men perished of hunger and thirst. By then, even his own tribesmen felt that he was too dangerous a man to be near. A group of Afshar and Qajar chiefs decided “to breakfast off him ere he should sup off them”. His own commanders surprised him in his sleep, but Nadir managed to kill two of them before the assassins cut off his head. Nadir was married four times and had 5 sons and 15 grandsons. Their deaths were ordered by Nadir’s successor. 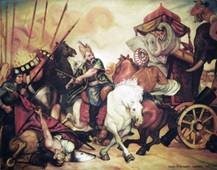 This entry was posted in History and tagged Mohammed Shah, Nadir Shah, Nadir Shahi Farmaan. Bookmark the permalink.